Crime, murder, the Orient Express, Miss Marple, Hercule Poirot - these are all terms synonymous with the queen of crime writing, Agatha Christie. Born on September 15, 1890, Christie grew up in Torquay, Devon, where she enjoyed a happy childhood. Christie's works include 80 detective novels, in addition to many short stories, romances, and stage plays, including The Mousetrap, which has been running continuously at London's St. Martin's Theatre since 1952. Christie's works have been translated into many different languages and spawned hugely successful movies, including Murder on the Orient Express. She ultimately became one of the first authors to be published in paperback by Penguin Books. A worked in a dispensary during WWI and it was there that her life-long interest in the use of poisons as a method of murder in detective fiction was born. Her first book, The Mysterious Affair at Styles published in 1920, introduced popular detective Hercule Poirot, who went on to appear in 33 novels and 54 short stories. Miss Marple, Christie's other famous detective, didn't make an appearance until 1930, in The Tuesday Night Club, a short story originally published in a magazine. She appears in a total of 12 novels and 20 short stories. It has been suggested that close to four billion copies of Christie's books have been sold worldwide. It should come as no surprise then that AbeBooks has an incredible selection of Agatha's work, including scarce first editions, signed copies, as well as affordable new and used copies of her best work. While an Agatha Christie collection doesn't necessarily have to break the bank, a Collins’ Crime Club first edition of Death on the Nile, published in 1937, did sell on AbeBooks for $9,836. 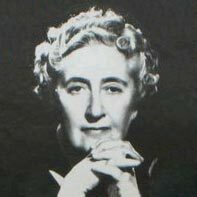 To learn more about Agatha Christie and her lustrous career, visit agathachristie.com. See an interesting timeline of Christie's life. What's your favorite Agatha Christie book?